Free hot breakfast buffet free Wi-Fi an indoor pool and flat-panel TVs are just what our guests ordered at the pet-friendly La Quinta Inn & Suites Fargo. The four-story La Quinta Inn & Suites has 119 contemporary rooms equipped with microwaves refrigerators coffeemakers and LCD flat-panel TVs with DVD players. Wi-Fi and local phone calls are free. The hotel is 100 percent non-smoking. Start your day with the hotel's free Bright Side BreakfastÃ? with waffles and other hot items accompanied by a complimentary newspaper. When you're ready to unwind check out the indoor pool area and spacious hot tub. Families will appreciate the children's wading pool and play area. On weekday evenings the Manager's Reception offers free drinks and appetizers. La Quinta also offers a business center a fitness center free parking and a local shuttle for destinations within three miles of the hotel and to the airport. Pets are welcome. 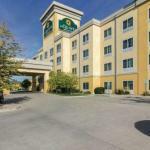 Located near I-94 La Quinta Inn & Suites Fargo is 12 minutes from Fargo's historic downtown. The Red River Zoo is less than a mile away and Concordia College and North Dakota State University are five miles from the hotel. Attractions within 15 minutes include the Heritage Hjemkomst Center Plains Art Museum Bonanzaville Pioneer Village Fargo Air Museum and Moorhead Center Mall. It's approximately eight miles to Hector International Airport.